A Dark Fantasy, dice rolling, worker placement and resource management game for 2 to 4 players. 2,655 backers pledged $148,452 to help bring this project to life. If you missed the campaign, do not worry!!! or use the button at the top-right of the screen. Nocturion is a Dark Fantasy, dice rolling, worker placement and resource management board game for 2 to 4 players. Players assume the role of powerful noble houses that are trying to fulfill quests and find their legendary heirlooms by gathering resources and forging mighty armies of beasts with variable asymmetric powers. The Noble house with most victory points proves its loyalty to the Emperor and wins the game. Well-known for his work on the game Brass, professional illustrator and game artist Damien Mammoliti joined the Vesuvius Media Team to create the stunning artwork of Nocturion. From the box cover all the way to the game board, the artwork is highly-detailed and beautifully crafted. Below you can see the contents of Nocturion's game box. Content from Stretch Goals will be added to the box as they are unlocked. The Deluxe Components (and all related Stretch Goals) will be packaged separately of the core game box, but there will be enough room in the plastic tray to fit them. 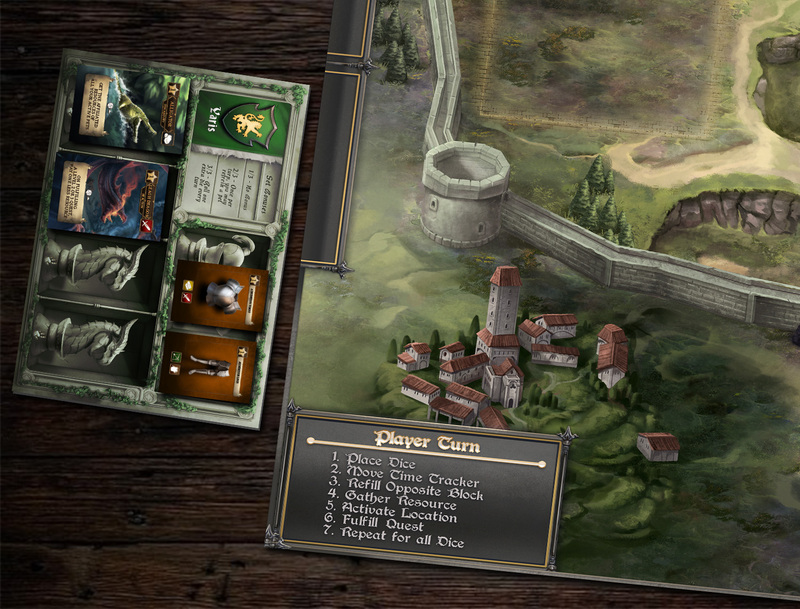 The board game Nocturion is based in the world of Nocturion, created by Mark Alexander for the online game Nocturion. The world has a history of several thousands of years and many many stories to be told. In the board game, you are the leader of a Noble House, trying to restore the world to its former glory... before being almost destroyed from demonic forces during the Sundering. The graphic novel, Echoes of Immortality, follows the stories of Moira, an orphan from Waterwatch who struggles to survive in the post-Sundering world of Nocturion. This 56-page, first volume, introduces chapters of Nocturion's rich lore and takes readers on a journey through the territories for which the Noble Houses are fighting. Browse through the first pages on our official website by clicking here. The art & design is by Gregory Santorineos. Visit our BoardGameGeek Fan Page and click on the "Heart" icon to become a fan. As soon as we reach the numbers above we will be unlocking these cool token upgrades for the Deluxe Edition! We are working into adding more languages. As they will become available we will be updating this page. Notice that players will still require to know basic English to read the text on the Beast and Curse cards. The sleeves are of standard quality (40 microns) and will be enough to cover all stretch goals we might unlock. Notice that the game includes 3 different types of cards (Square, Standard Euro and Mini Euro). The following is a list of rough estimates for shipping of the Nocturion basic pledge. Please keep in mind that these are just estimates, and costs may rise based on weight increases from unlocked stretch goals and any optional add-ons you choose. All prices are listed in US dollars. You will have an option to pick your game up at Essen Spiel'19. Just keep in mind that the game will be delivered way earlier than the conference (in August 2019 or even earlier if we manage it). Our plans is to have the game ready for GenCon release. If we manage to finish production a little bit earlier than expected, then we will give you that option to our Pledge Manager too. We want to thank all of the backers who have been supporting us and helping us create and deliver great games. That is why we have created a special Loyalty program. Whenever you select a pledge that has the Vesuvius Media Loyalty Credit item in it, you will receive a $5 Loyalty Credit for our next Kickstarter campaign to be used for add-ons. you will find the Loyalty credit assigned to your account, waiting for you to use it (unless you have already used it in the Dwar7s Fall Collector's Edition campaign). Keep in mind that the Loyalty Credit is per campaign and not per game. This means that if you backed us only in one campaign, even if you added all three games in a bundle, you will receive $5 credit. We do this to be fair to backers who have paid more shipping costs by supporting us in multiple campaigns. If you have Loyalty Credit from previous campaigns and choose not to use it in this one, then you will have an additional $5 for the next one. To be eligible for the Loyalty credit, you must pledge for a reward during this campaign. Late-pledges and pledges of $1 will not qualify for any type of Loyalty credit (credit from past campaigns or credit for future campaigns). To date, Vesuvius Media has successfully Kickstarted seven (7) board game projects: Centauri Saga, Cosmic Pioneers, Dwar7s Fall, Centauri Saga: Season 1, Covil: The Dark Overlords, Dwar7s Winter and Dwar7s Fall Collector's Edition. If your package arrives damaged, please take a few photos of all damaged items and email them to us at support [at] vesuviusmedia.com. We will send you replacements for the damaged items as soon as possible. The games shipped through this campaign will be sent out in a larger and stronger package, which will better protect the contents against damage. Our current estimation for delivery is August 2019. We want your orders to be delivered on time as much as you do; however, history has shown that despite the best laid plans there is always a chance of delay. As soon as this campaign is over, you will be requested to complete a survey in our pledge manager through which you can let us know which items you have ordered as well as where you would like us to ship your order. Keep in mind that your order may be shipped sooner or later than the estimated delivery date. Please give us an address that will surely not change (If for example you think that you may be moving to a new house around April, please give us the address of a friend or relative to ensure a successful delivery). Through this campaign you may receive updates on Vesuvius Media's other upcoming projects. Such updates will not be frequent. A copy of the Nocturion game + applicable Stretch Goals. You will get a copy of Nocturion, 60 upgraded tokens, a copy of the graphic novel and all stretch goals. 6 full bundles of Nocturion Deluxe Edition. Including all Stretch Goals and the graphic Novel! If you want more than 6 games, send us a message to give you our bulk order rates.